Dr. Michael Vitale (right), chaired the event and was joined by the event’s co-chair Dr. Lawrence Lenke (left). 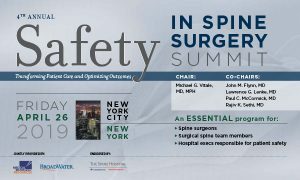 The Safety in Spine Surgery project was thrilled to have hosted the 3rd Annual Safety in Spine Surgery Summit on Friday, April 20, 2018 at NewYork-Presbyterian Hospital. The event brought together a diverse audience of spine surgeons, OR directors and hospital executives from across the nation to network and learn about the numerous safety and quality advances that are being made in the field. 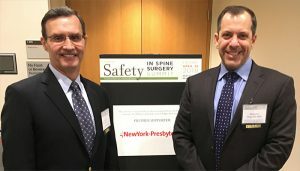 This year’s theme was “Toward New Rules of Engagement for an Increasingly Complex Spine World.” Dr. Michael Vitale (pictured in photo, right), chaired the event and was joined by the event’s co-chair Dr. Lawrence Lenke (pictured in photo, left).